I recently had a question from a customer asking how they know the paint is what I say it is and not something (presumably cheaper) else. No one had asked that before and I think it is a worthy question. I never expected to intended to get into the paint business. It seemed like a commodity business and a hassle to stock and store, and a source of problems if I ran out of one color or ordered other colors that nobody ended up wanting. So I advised customers on what brands folks reported success with and left it up to you to get the right paint. But not every store carried a 'good' brand, or they were out of the right color and the customer rolled the dice with a new brand. And I would get emails from customers who had a band with the paint peeling off in places, stuck fast in others, and just a mess. The mission of BYB is for folks to turn a misery into a source of pride. Even if it is not 'my' fault, I can't feel good if a customer goes from a plain band to a paint peeling, mess of a band. One day I got another paint-mess email from a customer and it was the straw that broke the camel's back. So decided to offer people the best quality paint options and then take responsibility for teaching the process of painting the band. First we offered DecoArt paint. It is good paint, but we found some quality control issues and one paint color would be good another would be lacking. So we are switching to Golden Fluid Acrylics. It is pricey stuff, generally between $9-10 on Amazon. And we offer it for $10 with a good paint brush. How can we offer a better deal than Amazon? I can't. As in I can't sell you a Golden Fluid Acrlics packaged 1oz bottle for less than Amazon. I can buy a 32-128oz jug of paint from Golden, repackage it to 1oz bottles, and sell that and a brush for $10 so that is what we do. And I have to. Conspicuously absent from the Golden website is light blue and light pink and light purple. Golden is accustomed to selling to a higher end customer, and higher end customers mix their own paint to get a full rainbow of colors. That is what we do also. I have developed the color mixing recipe for any paint shade we offer that is not directly available from Golden. I don't want to be in the paint business. Paint is messy to work with and labor intensive for me (I print the labels, apply to the bottles, mix the paint, pour the paint, and clean up bit of paint that always seems to get into the wild). Anyone in the screen printing business will tell you that it is a messy business! This is the long answer as to why you likely will receive paint packaged by BYB. It is not because we are charging for quality and then putting cheap paint in the bottle. Doing that would be shooting everyone in the process in the foot. It is because we have to offer paint to fulfill our mission to you. This entry was posted in Uncategorized on March 30, 2019 by wp_admin. 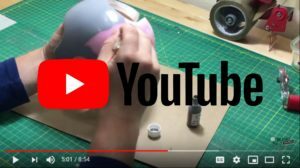 We also have painting instructions on YouTube! This entry was posted in Uncategorized on March 10, 2019 by wp_admin. 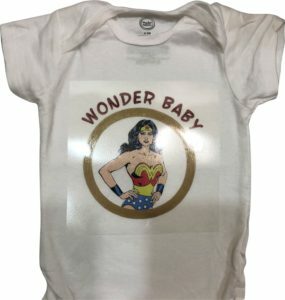 We offer matching heat transfers that you can apply to your own clothing! 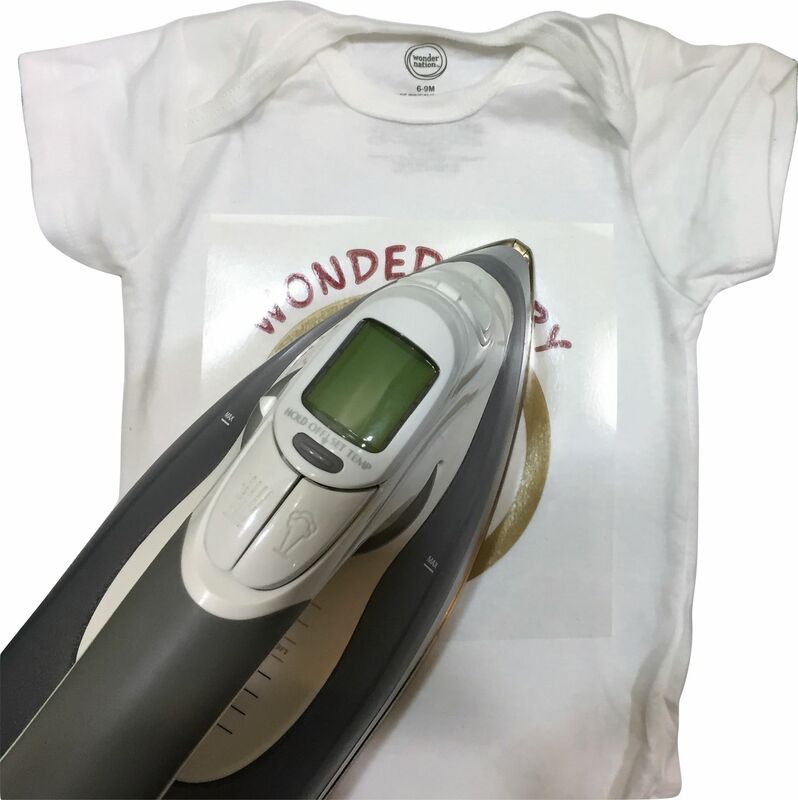 This guide will walk you through how to do that using an iron. 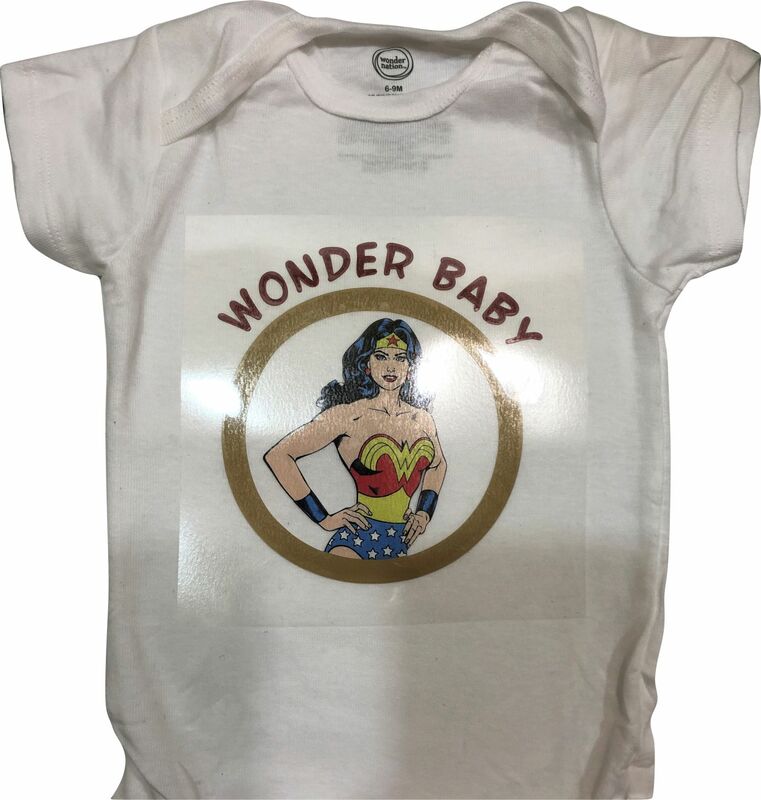 You can easily apply the designs to cotton clothing, but because the transfer bonds to clothing at 300 degrees Fahrenheit, you can also apply them to blends or pure polyester. However you need to be more careful not to overheat polyester during the ironing process. Step 1 - iron your item of clothing. 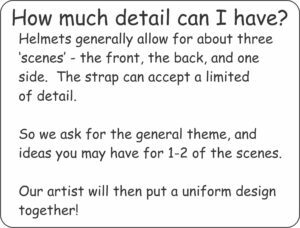 The design needs to be applied to flat fabric. If you are applying to new cotton clothing, it should be pre-shrunk or pre-washed by you. Step 2 - separate the plastic films. Start with the design face down, and at one corner. Yes it can be a little painful to get the films initially separated. I usually use a pocket knife to get it started. Then slowly pull back. The vinyl is slightly bonded to the top film, but the bottom film is sticky. When the films are separated, we want all the vinyl on the sticky bottom. But as we separate the films, some of the vinyl might want to stay with the top film. We will fix that with two methods. Notice in the leftmost picture below, I have sharply bent back the plastic film. This really helps the vinyl stay with the sticky bottom. In the middle picture, that didn't work with the red letter you see. So in the right most picture, you see that I pushed the films back together, with my finger pressing down on that trouble letter. Then I pull the films back apart, and then the letter stuck down as I wanted. Worst case, if a piece of vinyl gives trouble, move to a completely different edge and start from there. A different angle also usually fixes trouble spots. Step 3 - center the transfer on the shirt or onsie. At this point the design should be all on the sticky sided vinyl. Work in a clean area and protect the sticky side. The next step will be ironing this onto the clothing, and you don't want to iron anything 'extra' into your shirt. Step 4- iron the design onto the clothing. If you have a heat press, the recipe is 300 degrees Fahrenheit for 15 seconds at medium pressure. For your iron, Wool/Silk is perfect, Nylon will need a little more time, and Cotton a little less. Don't put water in the iron! You will just be using the iron for heat! How much time? 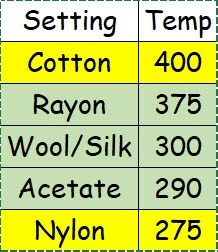 If you have a wool/silk setting Your iron should use about 20-25 seconds on each portion of the design with you pressing down and keeping the iron moving. As your iron probably can't cover the entire design in on go, work a section, and then move to the next. You want to melt the design into the shirt, but way to much temperature and way too much time will start to darken the design and blur it. Step 5 - after you are done ironing, let the shirt cool down from super hot to very warm, and then slowly remove the top plastic starting from one corner or side. Inspect the design for proper bonding. 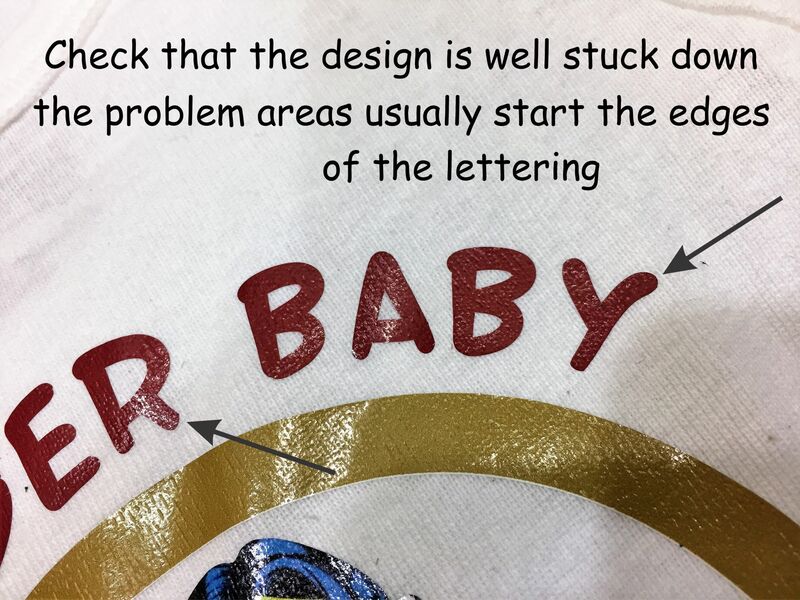 Trouble spots will be at the edges of lettering or thin designs as shown in the picture. 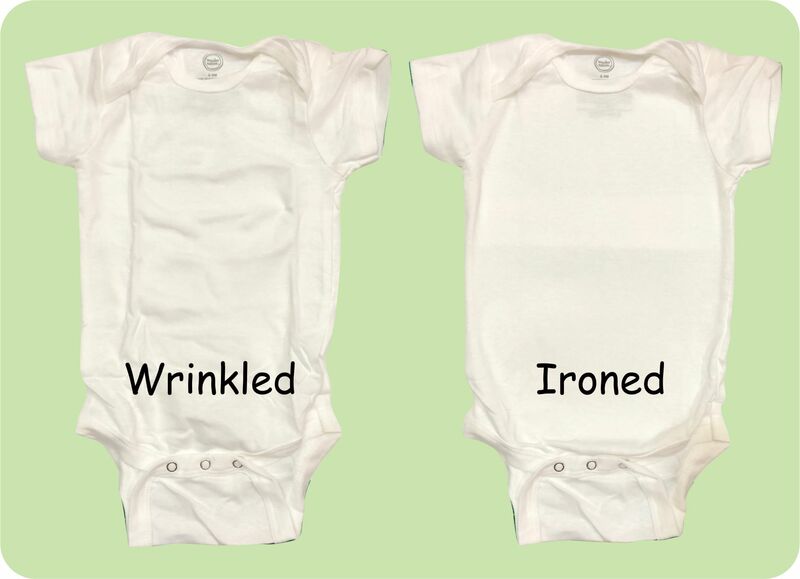 If the design is not firmly bonded, put the plastic film back over the design and re-iron till it is. You want the design to be like the image below - all of the design is firmly into the shirt. As the design was ironed onto the shirt, it is a little sensitive to heat. The clothing will last longer if dried on low heat, and turned inside out. If the decal starts to age, it can be refreshed back to new just by putting the film back over the design and re-iron it! This entry was posted in Uncategorized on March 9, 2019 by wp_admin. This entry was posted in Uncategorized on January 28, 2019 by wp_admin. This entry was posted in Uncategorized on January 27, 2019 by wp_admin. We have been working with metallic vinyls for a little while and we are ready to start shipping designs. Not every design will work with metallics. Our traditional vinyl feels pliable. The metallic vinyl feels harder. 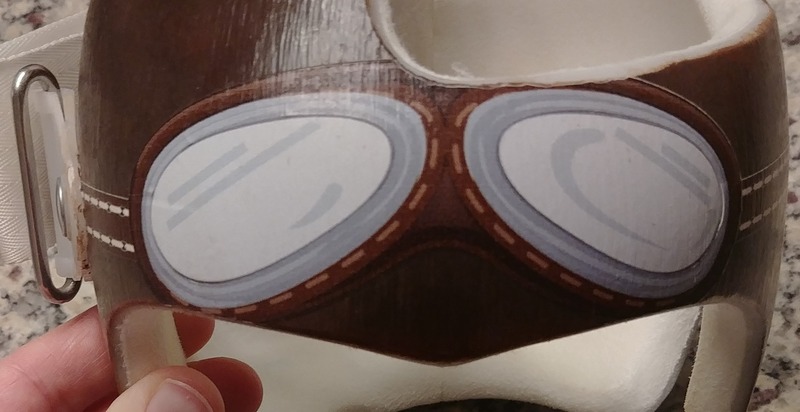 This means that larger elements like goggles are not a good choice for metallic vinyl. Our traditional vinyl is bright white, and colors print on it as you would expect. Our metallic vinyls are silver or gold or copper, not pure white, so colors appear a little different, like this teal oval on the crown. This however is half the advantage to the metallic vinyl. 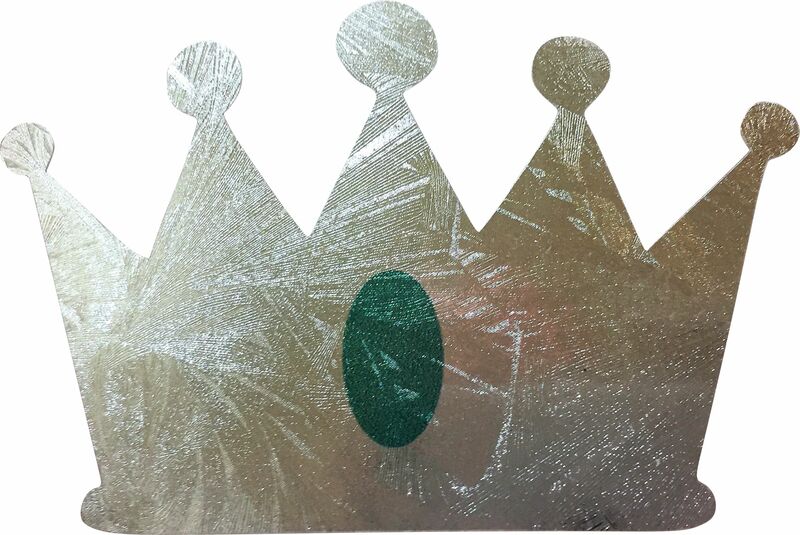 The printing ink is transparent, so light reflected from the band gives depth to designs. The other half of the benefit is unprinted (white areas) or lightly colored areas of vinyl is shiny and really catches eyes. Our metallic vinyls are still new for us, and there are still probably things to be learned about working with them. If you have issues, please let us know what they were, if you solved them, how, and if not, what can we change up? We will support you if you need a reprint. In exchange, we ask for picture pictures pictures! 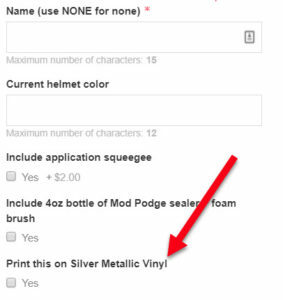 There are two ways to order decals with the metallic vinyl. 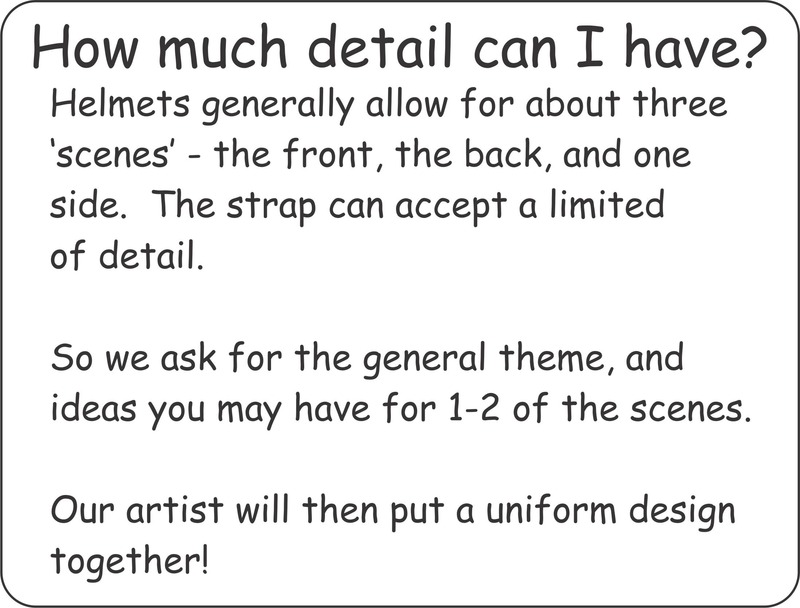 Some designs can be printed on both white or metallic silver, in which case we will start adding a checkbox. Other designs might have a lot of dark ink, and we will instead offer a separate design that takes better advantage of what metallic vinyl can do. 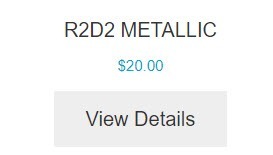 In this case, look for a design that has "METALLIC" in the name. Don't see what you want in metallic? Email us! It takes time to make all the changes and if you want a particular design, that work will get done now! This entry was posted in Uncategorized on December 3, 2018 by wp_admin. This entry was posted in Uncategorized on November 29, 2018 by wp_admin. This page is a special subset of our full decal application instructions. Getting glasses and goggles to lay flat on a helmet isn't hard - if you apply the decals with the correct process. 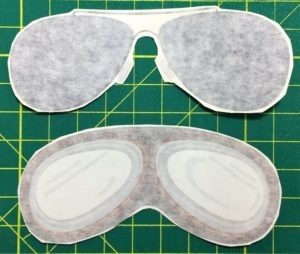 This is a step by step application guide for goggles and glasses. Step 1 - Separate out and cut around the goggles or glasses as closely as you can. 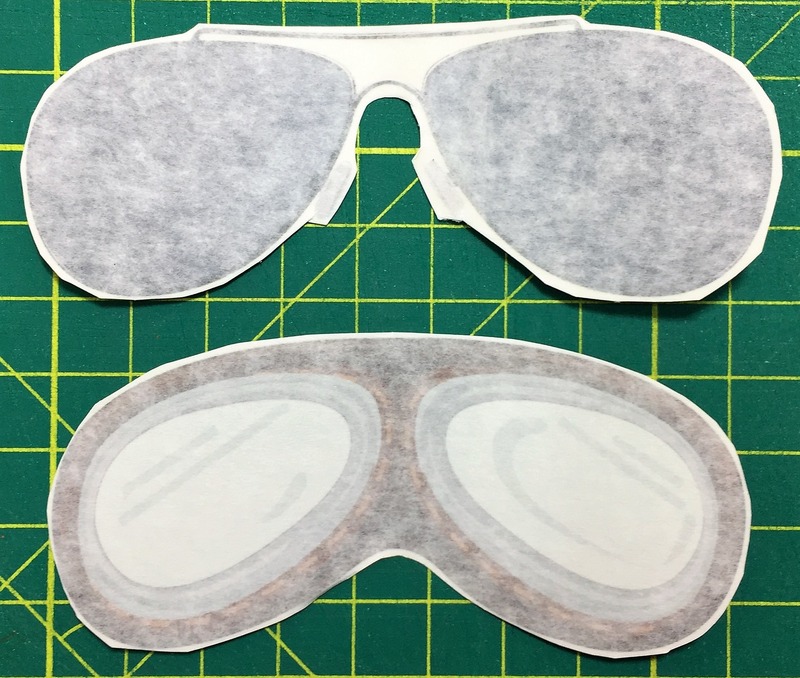 The transfer tape is not as flexible as the vinyl, so excess transfer tape just hinders the goggles laying flat around the edges. Step 2 - stick the goggles down in the center. 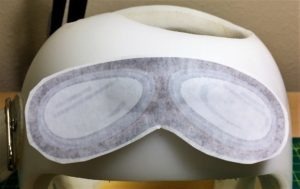 You can check if the goggles are centered as you want them on the band, and lift the goggles off and stick it down again if it is off center. Then use a squeegee, credit card or large coin to start sticking the decal down in the center. 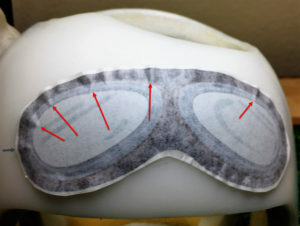 Step 3 - keep working out from the center, tacking down the goggles. Work in small, firm strokes. You can apply a lot of pressure to the vinyl. As you get more and more of the decal down, the more you will see excess vinyl building up at the edges. 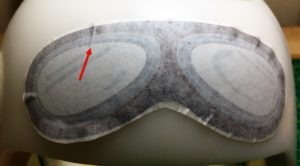 Step 4 - you have slowly worked from the center of the goggles to the edges, so where all but the edges is down and smooth. You worked in small strokes, a little at a time. As you get to this point, you will see the edges looking wavy, with vinyl lifted up at the red arrows. Take your squeegee/credit card/coin, and start at the inside and push these mountains (tip of the red arrows) down, a little at a time. Don't try to push one mountain flat and then move to the next one. Instead, push a little on a mountain, and then move to the next mountain and push a little on it. Step 5 - I have worked the left side top here to where almost all the little mountains are down. The red arrow is pointing to what could turn into a crease if I don't address it right. To fix the crease, use the sharp corner of the squeegee to apply a lot of pressure to the start of the crease (tip of the red arrow). 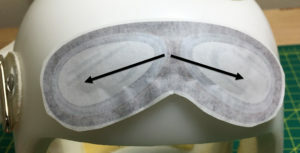 Apply a lot of pressure, and slowly slide from the start of the crease, to the edge of the goggles. Step 6 - I worked all the mountains. By being aggressive at the start of a crease, I eliminated it. This example shows why I don't make decals beyond a certain size. 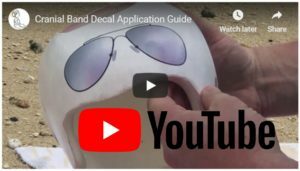 Applying a flat decal to a rounded helmet works up to a 2-3 inches, but it takes more and more experience and technique to get large decals down flat. You can go back to our full application instruction guide here. This entry was posted in Uncategorized on November 24, 2018 by wp_admin.